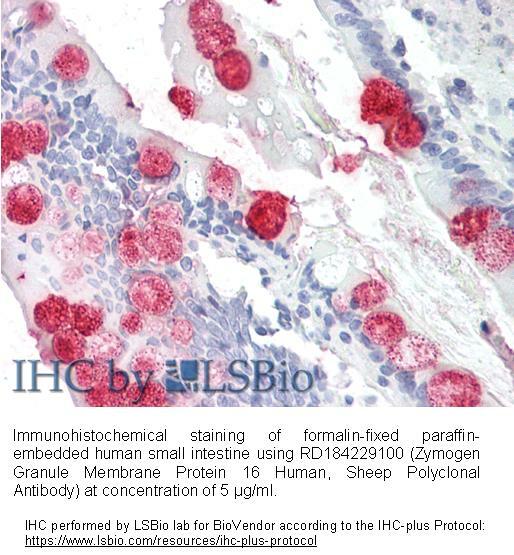 The antibody was raised in sheep by immunization with the recombinant Human Zymogen Granule Membrane Protein 16. The immunization antigen (17.9 kDa) is a protein containing 161 AA of recombinant Human Zymogen Granule Membrane Protein 16. N-terminal His-tag, 10 extra AA (highlighted). Immunoaffinity chromatography on a column with immobilized recombinant Human Zymogen Granule Membrane Protein 16. Zymogen granule membrane protein 16 (ZG16) is a 16 kDa protein first identified by immunoscreening of a rat pancreatic cDNA expression library with a polyspecific antiserum raised against purified zymogen granule membranes (ZGM). ZG16 displays sequence homology especially in the carbohydrate recognition domain to the plant lectin jacalin, which recognizes terminal galactose attached to N-acetylgalactosamine by a β1–3 linkage. According to its sequence homology with this lectin, ZG16 was considered a secretory lectin ZG16. Sequence analyses uncovered that ZG16 is highly conserved amongst mammals but also appears in many other species. 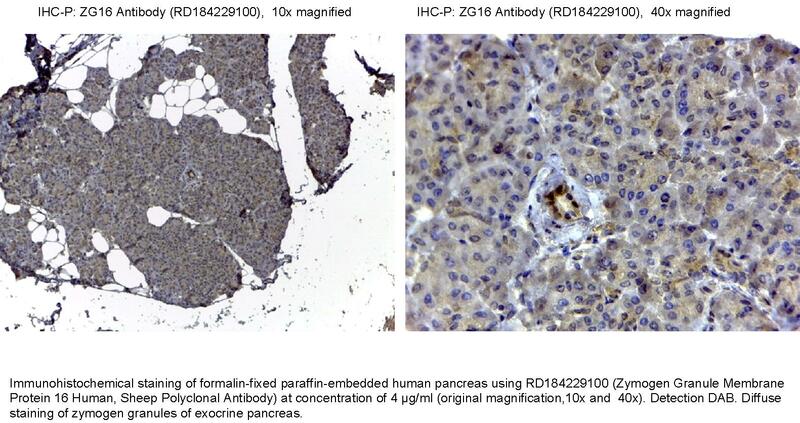 Rat ZG16 was found to be highly expressed in pancreas, colon, and duodenum, where the protein was localized in the zymogen granule of pancreas. The previous reports indicated that rat ZG16 took part in the formation of zymogen granule by mediating the digested enzymes to the zymogen granule membrane in pancreatic acinar cells. Human ZG16 was shown to be highly expressed in adult liver and moderately expressed in intestine (jejunum, ileum) and colon. Moreover, ZG16 is also weakly expressed in pedunculus cerebellaris but not in other brain’s regions. Owing to the specific expression pattern in human liver, ZG16 was evaluated in hepatocellular carcinoma (HCC), a common cancer worldwide (it was found that human ZG16 was significantly down-regulated in HCC). ZG16 protein took part also in several secretions of glycoproteins (the secretion of human ZG16 would be affected when the synthesis of glycans was inhibited with inhibitor or without glucose in cell culture).